April 22 marked the first day the temperature exceeded 60 degrees in 2018. Apparently, this is one of the longest waits for this milestone to occur on record. But after two mid-April snowstorms, we are more than deserving of the nice weather. I know my pale skin needs Vitamin D and my morale a boost. Hopefully, the nice weather sticks around. With the arrival of this nice weather, it seems people are back out on their patios drinking Coronas and playing Bags. This repopulation calls for the revival of grilling. Thus, I bring to you an extremely easy formula for kebabs. Prepare them in advance of your outdoor endeavors to avoid the worry of using a knife midway through a game of Bags. Cut onion and peppers and stew meat into 1” pieces. If you have large mushrooms, cut them in half. Build kebabs in whatever fashion you like; leave the meat and vegetables on different kebabs because the meat takes longer to cook. 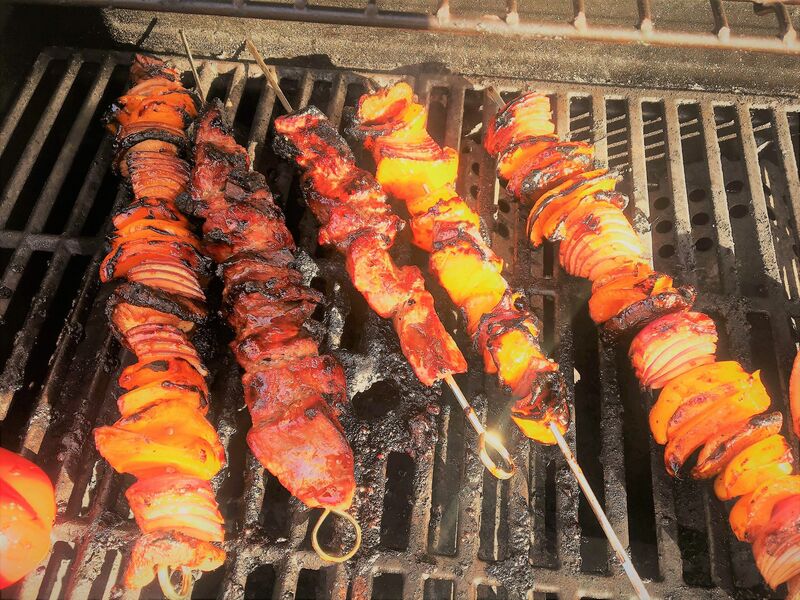 Grill kebabs on medium-high heat. Glaze them with the sauce and rotate them multiple times to ensure they cook evenly and don’t stick to the grill. Set some sauce aside to dress the cooked kebabs. Cook until veggies and meat are done — this varies widely depending on the grill. Eat plain, or serve with sides; re-glaze the cooked kebabs with the extra sauce.